From 15 to 17 March 2016, a High Level event on evaluating SDGs with an equity-focused and gender-responsive lens was held in New York City. The event was organized by UN Women IEO, EvalGender+ and UNEG in collaboration with EvalPartners, Global Parliamentarians Forum for Evaluation, IOCE, UNICEF, UNFPA, UNDP, Swiss Development Cooperation, CONEVAL Mexico, the Government of Sri Lanka and the Government of Tunisia. Gender equality and social equity are central to ensure the realization of sustainable and equitable development, including in emergency and humanitarian contexts. The persistence of social inequity and significant gender inequalities in the world, including in low, middle and high income countries, presents a major barrier to equitable and sustainable development, negating fundamental human rights and the expansion of human freedoms. The future Sustainable Development Goals (SDGs), which will replace the existing Millennium Development Goals (MDGs), will very likely include gender-equality and reducing inequalities as two stand-alone goals, as well as mainstream them within all goals. Given that the SDGs will be “localized” in national development goals and strategies, gender equality and social equity are expected to be among the key strategies and outcomes mainstreamed in global and national development strategies. How the global evaluation community can strengthen national evaluation systems, with the aim of contributing to the achievement of sustainable and equitable development, by providing relevant and good-quality gender-responsive and equity focused evidence to inform the design and implementation of international (including future Sustainable Development Goals), regional and national development policies and programmes? The third issue of the EvalGender newsletter (Issue #3, October 2017) is now available! “Guide to including a gender+ perspective in VOPEs: innovating to improve institutional capacities” is now published. The Community of Practice on Gender and Evaluation, with more than 1,100 members globally is an open global platform that promotes engendering national policy through evaluation. Gender and Evaluation will serve as a knowledge hub for equity-focused and gender-responsive evaluation (EFGRE) on behalf of EvalGender+. We invite you to join the CoP by signing up at http://gendereval.ning.com and be part of the Gender and Evaluation growing community! Following the approval of the 17 Sustainable Development Goals (SDGs) by the UN General Assembly, EvalGender+, United Nations Evaluation Group (UNEG) and the Independent Evaluation Office (IEO) of UN Women, in collaboration with EvalPartners, Global Parliamentarians Forum for Evaluation, International Organizations for Cooperation in Evaluation (IOCE), United Nations Children’s Fund (UNICEF), United Nations Population Fund (UNFPA), Swiss Development Cooperation and Coneval Mexico have the pleasure to launch a multi-stakeholder consultative process to develop guidance to strengthen M&E systems to assess SDGs with an equity-focused and gender-responsive lens. On June 1, 2016, we published 2 videos of the event, for the morning and afternoon presentations. Click the links below to view them. 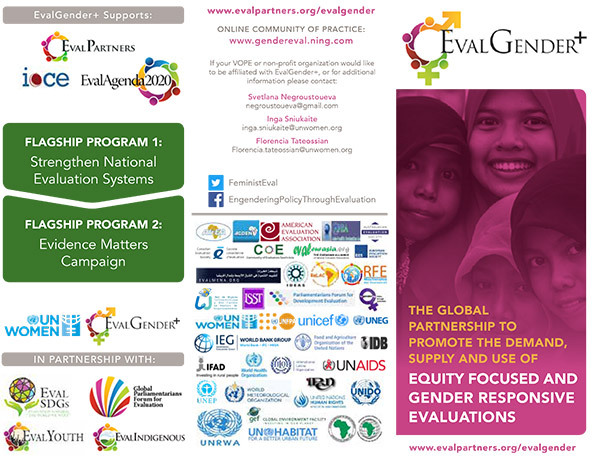 EvalGender+ was launched during the Global Evaluation Week at the Parliament of Nepal on 25 November 2015 in front of 450+ development professionals and policy makers, including almost 100 Parliamentarians from all over the world. Does your country has a National Evaluation Policy? If yes, does it include Equity Focused and Gender Responsive Evaluation aspects in the policy? If not, are there any efforts to work on the policy? Would you like to include Equity Focused and Gender Responsive Evaluation aspects in the draft policy?